Nothing to worry about, ladies. Zac Efron is still as handsome as ever after his accident! Zac Efron showed off his newly healed jaw at an American football game this weekend. The 26-year-old hunk sported a huge grin as his favorite team, the Indianapolis Colts, beat the Houston Texans on Sunday (December 15, 2013). This comes weeks after the High School Musical star had his mouth wired shut after breaking his jaw when he fell flat on his face outside his home in Los Angeles, California. 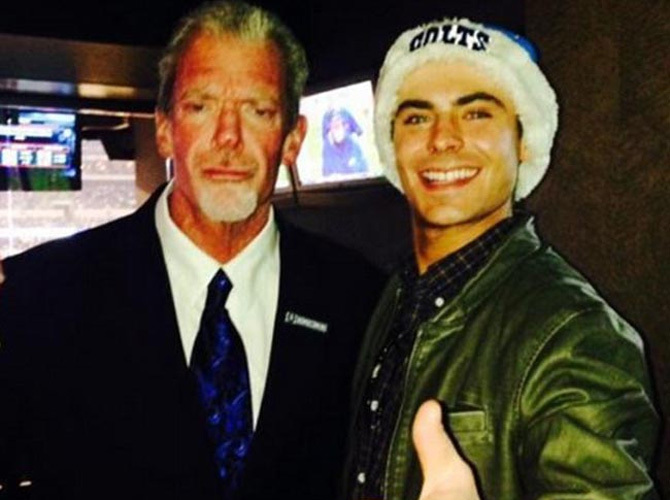 Zac flaunted his perfect teeth and healed jaw in a picture he posted on social networking site WhoSay, which features him and Colts team owner Jim Irsay. He added the caption: "for a truly memorable trip to Indie. congrats on the win, @Colts! (sic)"
Zac has been in tremendous pain of late following the accidental injury, which resulted in the actor canceling his upcoming promotional tour for new movie, That Awkward Moment, after being given stitches by medics and told to rest up. Zac seems to have had a tough year as he also completed time in rehab for alleged cocaine and alcohol abuse, but appears to have made a full recovery. The Parkland star is thought to have entered treatment after friends expressed their concern about his "erratic" behavior while filming raunchy new comedy, Neighbors.